Emmett knows he has been given a one in a million chance when he is selected by The Babel Corporation to travel to Eden, a planet many light years away. On the one year journey to Eden he is competing against nine other teens to be one of the top eight point-getters who will be allowed to go down to the planet and mine nyxia, a substance that can do almost anything. The eight winners will be set up for life with money, health care, and status. With his background and his mom's illness, Emmett needs to be a winner, but so do his opponents. Babel only chose teens who all have hard luck stories and all of them want to win, at any cost. 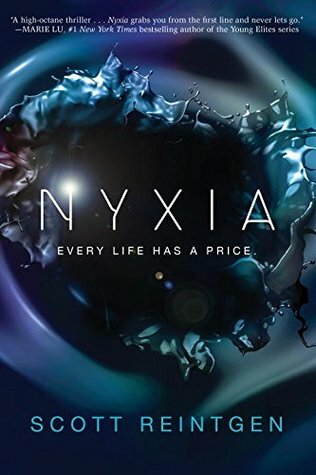 Nyxia is a fun story with several interesting characters and I had fun while I was reading it despite the similarities to Hunger Games in some of the themes. I feel pretty sure, however, that it is one of those books that is going to fade quickly. In a few months, I'll be going through my bookshelf and see that I gave it four stars but not be able to remember much of anything about it. So if you're looking for a meaningful, stick in your mind book, this might not be it. But if you just want some quick and entertaining sci fi for right this minute, check it out.